In my previous post, I described my possession danger rating model, which classifies attacks according to their proximity to goal and their relative occurrence compared to other areas of the pitch. Each possession sequence in open-play is assigned a value depending on where it ends. The figure below outlines the model, with possession sequences ending closer to goal given more credit than those that break down further away. Map of the pass weighting model based on data from the English Premier League. Data via Opta. Instead of just looking at this metric at the team level, there are numerous ways of breaking it down to the player level. For each possession, a player could be involved in numerous ways e.g. winning the ball back via a tackle, a successful pass or cross, a dribble past an opponent or a shot at goal. Players that are involved in more dangerous possessions may be more valuable, particularly when we compare them to their peers. When viewing teams, we may identify weak links who reduce the effectiveness of an attack. Conversely, we can pick out the stars in a team or indeed the league. One popular method of analysing the influence of players on a team is network analysis. This is something I’ve used in the past to examine how a team plays and who the crucial members of a team are. It looks at who a player passes the ball to and who they receive passes from, with players with many links to their teammates usually rated more highly. For example, a midfield playmaker who provides the link between a defence and attack will often score more highly than a centre back who mainly receives passes from their goalkeeper and then plays a simple pass to their central defensive partner. In order to assess the influence of players on attacking possessions, I’ve combined the possession danger rating model with network analysis. This adjusts the network analysis to give more credit to players involved in more dangerous attacks, while also allowing us to identify the most influential members of a team. Below is an example network for Liverpool last season during a 10 match period where they mainly played in a 3-4-3 formation. The most used eleven players during this period are shown according to their average position, with links between each player coloured according to how dangerous the possessions these links contributed to were. Possession network for Liverpool for the ten matches from Swansea City (home) to Burnley (home) during the 2014/15 season. Lines are coloured according to the relative danger rating per each possession between each player. Player markers are sized by their adjusted closeness centrality score (see below). Data via Opta. Philippe Coutinho (10) was often a crucial cog in the network as he linked up with many of his team mates and the possessions he was involved with were often dangerous. His links with Sakho (17) and Moreno (18) appears to have been a fruitful avenue for attacks – this is an area we could examine in more detail via both data and video analysis if we were scouting Liverpool’s play. Over the whole season, Coutinho was easily the most crucial link in the team, which will come as no surprise to anyone who watched Liverpool last season. We can go further than players on a single team and compare across the entire league last season. To do this, I’ve calculated each players ‘closeness centrality‘ score or player influence score but scaled it according to how dangerous the possessions they were involved in were over the season. The rating is predominantly determined by how many possessions they are involved in, how well they link with team mates and the danger rating of the possessions they contribute to. Yaya Touré leads the league by some distance due to him essentially being the crucial cog in the best attack in the league last season. Many of the players on the list aren’t too surprising, with a collection of Arsenal and Manchester City players high on the list plus the likes of Coutinho and Hazard also featuring. The ability to effectively dictate play and provide a link for your team mates is likely desirable but the level of involvement a player has may be strongly governed by team tactics and their position on the field. One way around this is to control for the number of possessions a player is involved in to separate this out from the rating; Devin Pleuler made a similar adjustment in this Central Winger post. Below are the top twenty players from last season according to this adjusted rating, which I’m going to refer to as an ‘influence rating’. 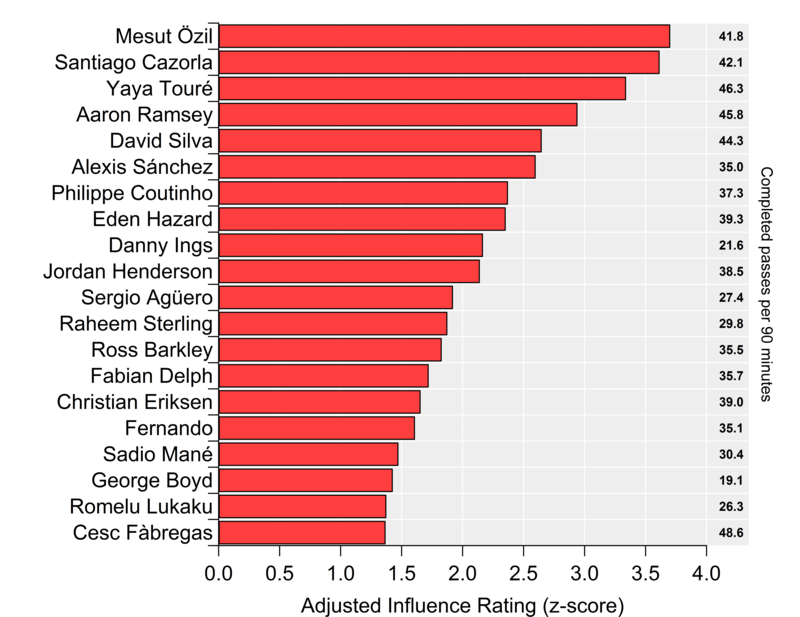 Top twenty players (minimum 1800 minutes) per the adjusted influence rating for the 2014/15 Premier League season. The number of completed passes each player made per 90 minutes is shown on the left. Data via Opta. When accounting for their level of involvement, Mesut Özil rises to the top, narrowly ahead of Santi Cazorla and Yaya Touré. While players such as these don’t lead the league in terms of the most dangerous passes in open-play, they appear to be crucial conduits for their respective attacks. That might entail choosing the best options to facilitate attacks, making space for their team mates or playing a crucial line-breaking pass to open up a defence or all of the above and more. There are some surprising names on the list, not least the Burnley duo of Danny Ings and George Boyd! Their level of involvement was very low (the lowest of those in the chart above) but when they were involved, Burnley created quite dangerous attacks and they linked well with the rest of the team. Burnley had a reasonably decent attack last season based on their underlying numbers but they massively under-performed when it came to actual goals scored. The question here is would this level of influence be maintained in a different setup and with greater involvement? Ross Barkley is perhaps another surprising inclusion given his reputation outside of those who depict him as the latest saviour of English football. Looking at his passing chart and links, this possibly points to the model not accounting for crossing often being a less effective method of attack; his passing chart in the final third is biased towards passes to wide areas, which often then results in a cross into the box. Something for version 2.0 to explore. He was Everton’s attacking hub player, which perhaps helps to explain their lack of penetration in attack last season. The above is just one example of breaking down my dangerous possession metric to the player level. As with all metrics, it could certainly be improved e.g. additional measures of quality of possession could be included and I’m aware that there are likely issues with team effects inflating or deflating certain players. Rating across all players isn’t completely fair, as there is an obvious bias towards attack-minded players, so I will look to break it down across player positions and roles. Regular visitors will know that I’ve been working on some metrics in relation to possession and territory based on the difficulty of completing passes into various areas of the pitch. 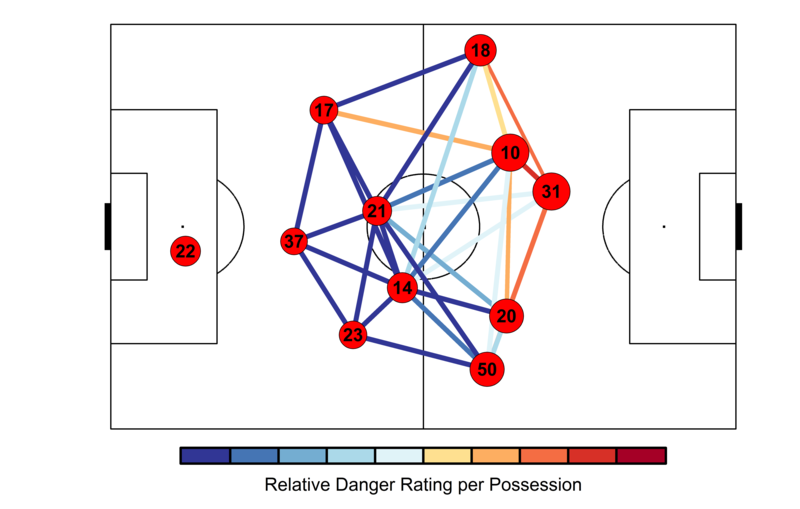 To recap, passes into dangerous areas are harder to complete, which isn’t particularly revelatory but by building some metrics around this we can assess how well teams move the ball into dangerous areas as well as how well they prevent their opponents from doing so. These metrics can also be broken down to the player level to see which players complete the most ‘dangerous’ passes. Below is the current iteration of the pass danger rating model based on data from the 2014/15 Premier League season; working the ball into positions closer to the goal is rewarded with a larger rating, while passes made within a teams own half carry very little weight. One particular issue with the Territorial-Possession Dominance (TPD) metric that I devised was that as well as having a crap name, the relationship with points and goal difference could have been better. The metric tended to over-rate teams who make a lot of passes in reasonably dangerous areas around the edge of the box but infrequently complete passes into the central zone of the penalty area. On the other side of the coin, it tended to under-rate more direct teams who don’t attack with sustained possession. In order to account for this, I’ve calculated the danger rating by looking at attacks on a ‘possession’ basis i.e. by tracking individual chains of possession in open-play and looking at where they end. The end of the chain could be due to a number of reasons including shots, unsuccessful passes or a tackle by an opponent. Each possession is then assigned a danger rating based on the model in the figure above. Possessions which end deep into opponent territory will score more highly, while those that break down close to a team’s own goal are given little weight. Conceptually, the model is similar to Daniel Altman’s non-shot based model (I think), although he views things through expected goals, whereas I started out looking at passing. You can find some of the details regarding the model here, plus a video of his presentation at the Opta Pro Analytics Forum is available here, which is well worth watching. The ratings for last season’s Premier League teams are shown below, with positive values meaning a team had more dangerous possessions than their opponents over the course of the season and vice versa for the negative values. Overall, the correlation between the metric and goal difference and points is pretty good (r-squared values of 0.76 and 0.77 respectively). This is considering open-play only, so it ignores set pieces and penalties, plus I omitted possessions made up of just one shot. The correlation with open-play goal difference is a little larger, so it appears to be an encouraging indicator of team strength. 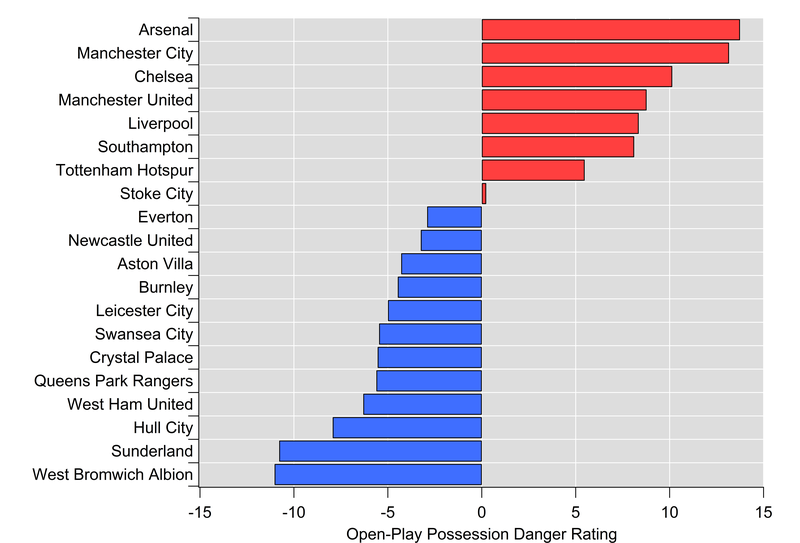 Open-Play Possession Danger Rating for the 2014/15 English Premier League season. Zero corresponds to a rating of 50%. Data via Opta. The rating only takes into account the location of where the possession ends so there is plenty of scope for improvement e.g. throughball passes could carry more weight, counter-attacks could receive an increased danger rating, while moves featuring a cross might be down-weighted. Regardless of such improvements, these initial results are encouraging and are at a similar descriptive level to traditional shot ratios and expected goal models. Arsenal are narrowly ahead of Manchester City here, as they make up a clear top-two which is strongly driven by their attacking play. Intriguingly, Manchester City’s rating was much greater (+7%) for possessions ending with a shot, while Arsenal’s was almost unchanged (-1%). Similarly to City, Chelsea’s rating for possessions ending with a shot was also greater (+4%) than their rating for all possessions. I don’t know yet if this is a repeatable trait but it suggests Chelsea and City were more efficient at generating quality shots and limiting their opponents. Manchester United sit narrowly ahead of Liverpool and Southampton and round out the top four, which was mainly driven by their league-leading defensive performance; few teams were able to get the ball into dangerous positions near their goal. Manchester United’s ability to keep their opponents at arms length has been a consistent trend from the territory-based numbers I’ve looked at. Analytics anti-heroes Sunderland and a West Brom team managed by Tony Pulis for a large chunk of last season reside at the bottom of the table. Sunderland comfortably allowed the most dangerous possessions in the league last season. So, we’re left with yet another team strength metric to add to the analytics pile. The question is what does this add to our knowledge and how might we use it? Analytics has generally based metrics around shots, which is sometimes not reflective of how we often experience the game from a chance creation point of view. The concept of creating a non-shot based chance isn’t a new one – the well worn cliché about a striker ‘fluffing a chance’ tells us that much but what analytics is striving to do is quantify these opportunities and hopefully do something useful with them. Basing the metric on all open-play possessions rather than just focusing on shots potentially opens up some interesting avenues for future research in terms of examining how teams attack and defend. Furthermore, using all possessions rather than those just ending with a shot increases our sample size and opens up the potential for new ways of assessing player contributions. Looking at player contributions to these possessions will be the subject of my next post.